The method of biological effect according to the Teachings of Grigori Grabovoi is the technology of setup of man’s consciousness by thinking so that, based on the corpuscular-wave nature of the world, to create a resonance wave of light of man’s consciousness, which ensures the control of the wave nature of the world. As the world at the atomic level consists of microwaves, through the training of consciousness based on the Teaching of Grigori Grabovoi, man can develop the spirit to the level where the wave processes of the world, and therefore the physical processes may occur due to the actions of the human spirit. Thus, people will be able to combine the atoms of their bodies that operate on the biological principle so far and become invulnerable and forever living. Thus due to the developed consciousness and spirit, due to the developed in such a way the soul level that receives knowledge from the Creator, man will be able at any moment to assemble his body at the physical level. Generating by man of normalizing bio-signals that appear with thinking and concentrations during the process of use of the works of Grigori Grabovoi were described and protected as a method by the patent of Grigori Grabovoi “Method for prevention of Catastrophes and Device for its Realization.” The description of the patent reads that the method of application of the action, which “generates bio-signals, further contributes to normalization of the situation in the zone of the supposed catastrophe”. The description of the patent includes scientific, instrumental and practical based on results justifications of the method of normalization of events with the normalizing bio-signal. Thus, there is a patented method proving that reading and study of the works of Grigori Grabovoi contributes to normalization of man’s events in the direction of eternal development. Since the prevention of catastrophic events in the body and the environment by means of application of man’s consciousness that generates bio-signals through thinking organizes eternal life. “Method for prevention of Catastrophes and Device for its Realization” No. 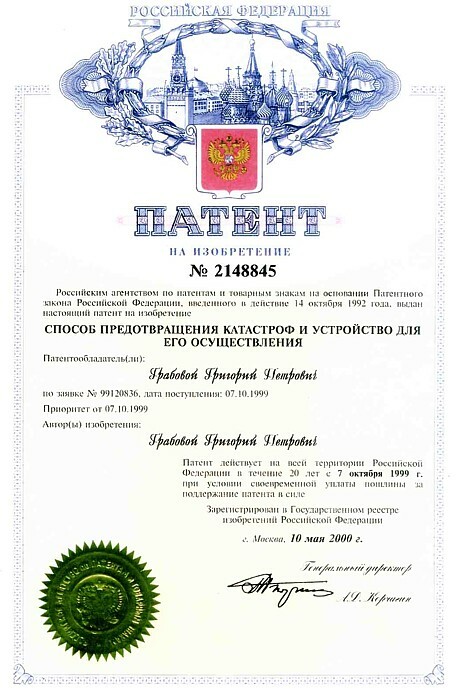 2148845 of May 10, 2000, is available in the Internet at the official website of the Russian Federal Service for Intellectual Property, Patents and Trademarks www1.fips.ru. Address: Berezhkovskaya nab, 30, building 1, Moscow, Russia, Г-59, ГСП-5, 123995, Phone: +7 (499) 240-60-15, fax: +7 (499) 243-33-37. The system of transformation of a thought into the light radiation for transfer of information for the purpose of normalizing control and learning that occurs with thinking and concentrations in the process of use of the works of Grigori Grabovoi is protected by the patent for invention of Grigori Grabovoi “Information Carrying System”. The description of the mentioned patent reads that “According to the wave theory of synthesis and the laws of quantum mechanics the thought transformed into radiation can simultaneously have two quantum state (see Grigori Grabovoi “Research and analysis of fundamental definitions of optical systems in prevention of catastrophes and forecast oriented control of micro processes”, “Electronic engineering, series 3, issue 1(153), p.10)”. “The declared information carrying system works as follows. A man who generates thoughts is an operator (not specified) who transmits the information.” Thus, the transfer of data to any system by using thoughts was patented. This makes it possible to send normalizing radiation of a thought formed by the works of Grigori Grabovoi in the area of the body and the environment to the area of eternal development and thus create eternal life. The description of the patent for the invention of Grigori Grabovoi “Information Carrying System” No. 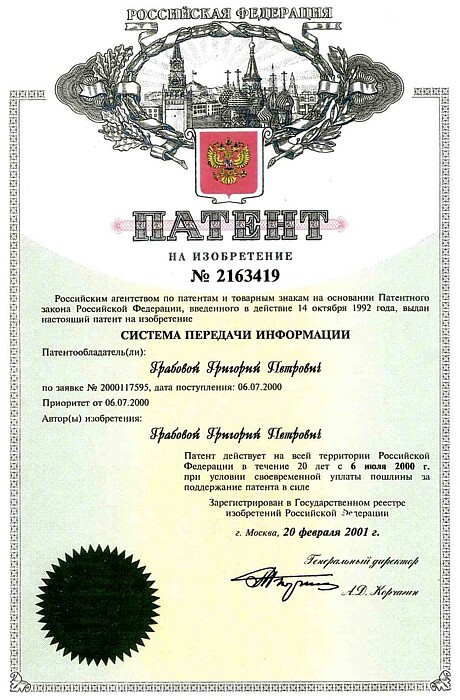 2163419 of February 20, 2001, is available in the Internet at the official website of the Russian Federal Service for Intellectual Property, Patents and Trademarks www1.fips.ru. Address: Berezhkovskaya nab, 30, building 1, Moscow, Russia, Г-59, ГСП-5, 123995, Phone: +7 (499) 240-60-15, fax: +7 (499) 243-33-37. Patents “Method for prevention of Catastrophes and Device for its Realization” and “Information Carrying System” can be used for normalization of state; for revitalizing each shattered human cell and consequently the whole person with normal health. According to the description of the patent “Method for prevention of Catastrophes and Device for its Realization” the destroyed or damaged human cells status refers to the catastrophic state of matter of natural, but not man-made nature. The text of the patent reads, “for the natural disasters the area of the catastrophe origin has characteristics with radiation higher than of other parts of the element by 20-28%”. Therefore, the task of the specialist, who uses the technologies of the patent, is to place the destroyed or damaged cell near the picture of the healthy human tissue cell and reduce by 20-28% the characteristics of radiation emanating from the destroyed or damaged human cells, which indicate non-functionality of the cell. According to the description of the patent it is required in the device to activate the system of signal registration and the emitter, which generates signals that contribute to normalization in this zone.” “The emitter that generates the signals”, as described in the patent, forms assembled based on the light radiation wave nano systems, that collect atoms and molecules in the state, in which they are in a cell of a living person. With a small volume of the device crystals constructed based on the patent and single action of nanosecond pulses of the laser radiation and short time work human operator who generates bio-signals, restoration of life of a single cell is implemented. Increase in the volume of the device crystals or the use of microprocessor systems, plurality of nanosecond pulses of laser radiation and increase of the duration or strength of work of the human operator who generates bio-signals, a continuous recovery of an area of many cells takes place. With the increase of the power of work of the recovery system, which acts in accordance with the patent, restoration of all human cells takes place, that is, the person is returned to life. The devices that are based on the patent of Grigori Grabovoi intensify the effect of human consciousness and are a kind of training, which trains consciousness to the level when it alone, without the devices, will be able to evoke spiritual processes that restore cells and the whole human body. Grigori Grabovoi’s devices provide a transition towards the society of eternal life.